Elder Jeffrey R. Holland, during the LDS General Conference on October 4, 2009, delivered a sermon entitled “Safety for the Soul.” In it, Elder Holland spoke of “prophecies regarding the last days” and how individuals could find safety and shelter from strife and calamities foretold. Following those words came one of the most powerful apostolic witnesses of the Book of Mormon. After recounting how Hyrum Smith read from the Book of Mormon (Ether 12:36–38) on the day of his and Joseph Smith’s martyrdom, Elder Holland remarked, “before closing the book, Hyrum turned down the corner of the page from which he had read, marking it as part of the everlasting testimony for which these two brothers were about to die.” Then came perhaps the most unforgettable moment of Elder Holland’s testimony. I hold in my hand that book, the very copy from which Hyrum read, the same corner of the page turned down, still visible. Later, when actually incarcerated in the jail, Joseph the Prophet turned to the guards who held him captive and bore a powerful testimony of the divine authenticity of the Book of Mormon. Shortly thereafter pistol and ball would take the lives of these two testators. 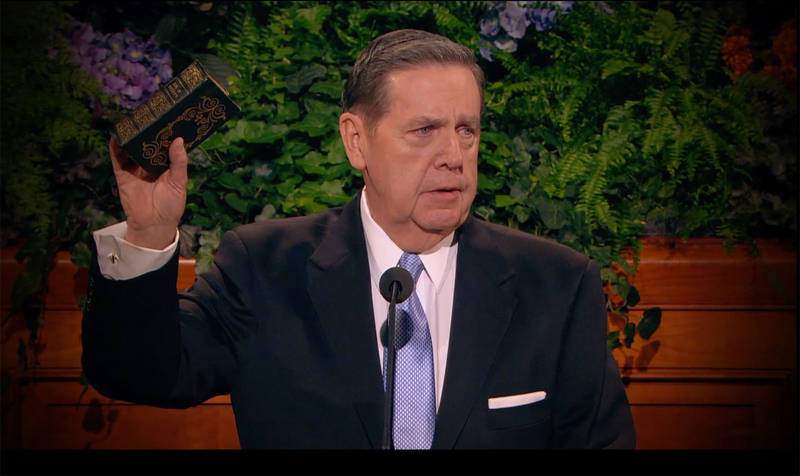 Elder Holland then declared his own testimony of the Book of Mormon, but not before asking a penetrating question to those who question the book’s divinity. As one of a thousand elements of my own testimony of the divinity of the Book of Mormon, I submit this as yet one more evidence of its truthfulness. In this their greatest—and last—hour of need, I ask you: would these men blaspheme before God by continuing to fix their lives, their honor, and their own search for eternal salvation on a book (and by implication a church and a ministry) they had fictitiously created out of whole cloth? . . . [T]ell me whether in this hour of death these two men would enter the presence of their Eternal Judge quoting from and finding solace in a book which, if not the very word of God, would brand them as imposters and charlatans until the end of time? They would not do that! They were willing to die rather than deny the divine origin and the eternal truthfulness of the Book of Mormon. Elder Holland emphasized the significance of the Book of Mormon for those who contemplate leaving the Church. “If  anyone  is foolish enough or misled enough to reject 531 pages of a heretofore unknown text teeming with literary and Semitic complexity without honestly attempting to account for the origin of those pages . . . then such a person, elect or otherwise, has been deceived; and if he or she leaves this Church, it must be done by crawling over or under or around the Book of Mormon to make that exit.” He concluded with a powerful apostolic witness of the truthfulness of the Book of Mormon that stands in effect today. I ask that my testimony of the Book of Mormon and all that it implies, given today under my own oath and office, be recorded by men on earth and angels in heaven. I hope I have a few years left in my “last days,” but whether I do or do not, I want it absolutely clear when I stand before the judgment bar of God that I declared to the world, in the most straightforward language I could summon, that the Book of Mormon is true, that it came forth the way Joseph said it came forth and was given to bring happiness and hope to the faithful in the travail of the latter days. Jeffrey R. Holland, Christ and the New Covenant: The Messianic Message of the Book of Mormon (Salt Lake City, UT: Deseret Book, 1997).